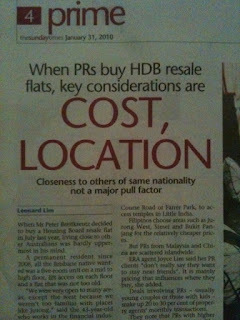 The full header and sub-header actually read, "When PRs buy HDB resale flats, key considerations are Cost, Location. Closeness to others of same nationality not a major pull factor". The article seemed somewhat inspired by Minister Mentor Lee Kuan Yew's statement last week that the Government did not want to see new citizens congregate and would disperse them across HDB estates. I was approached last week by journalists from the Straits Times who were interested in a couple of articles that I'd written here at Aussie Pete blog, and wanted to gain more information about us personally and reasons why we chose to purchase our HDB apartment in Sengkang. "When Mr Peter Breitkreutz decided to buy a Housing Board resale flat in July last year, living close to other Australians was hardly uppermost in his mind. A permanent resident since 2008, all the Brisbane native wanted was a five-room unit on a mid to high floor, lift access on each floor and a flat that was not too old. "We were very open to many areas, except the west because we weren't too familiar with places like Jurong," said the 43-year-old who works in the financial industry. He and his wife, who is from China, viewed properties in Woodlands, Ang Mo Kio and Pasir Ris before settling for one in Sengkang. The flat was close to a pre-school in Yio Chu Kang that they could enrol their two-year-old son in. It was also a five-minute drive to his office in Ang Mo Kio, until he took up a new job in the city recently. The flat's valuation was $400,000 but, after negotiations with the seller, the couple knocked back the price to $375,000. The factors influencing their purchasing decision are not unique, said property agents. They, as well as other PRs from countries like India, China and Indonesia confirm that similar considerations are at play behind their resale-flat transactions...."